"I've always felt that Kish was one of the most talented chefs around. Her food hints at a classic American Midwest background and you catch glimpses of those old-school dishes in recipes like the Baked Potato Purée and the Roasted Whole Hen-of-the-Woods with Wild Rice. I mean these are the feel-good foods you wish your mom made. They are tasty, flavorsome, and familiar enough to be appreciated by both the professional and home cook alike." "Here is the stunning first book from a young chef whom we have been impressed by for many years now. The results are nothing short of superb. The beautiful, thoughtful, and delicious food is baked in to each chapter, but it's the personal aesthetic and the impassioned revealing story of this rising star that ties together the recipes with a heartfelt point of view. I expected nothing less than a spectacular debut from my friend Kristen, and she over delivered. What we are gifted is a must have book for any home cook, and something to aim at for any professional seeking to clarify what makes food a personal journey." "A lovely compilation of 80 plus recipes that captured the essence of Kristen. A window into her life as a cook and into the search for her own identity. I was captivated by the simplicity, details of her dishes, yet the elegance of her cuisine was shining through." "[Kristen's] followers will enjoy the personal insights, and diehard Top Chef fans will savor the peek behind the curtain." 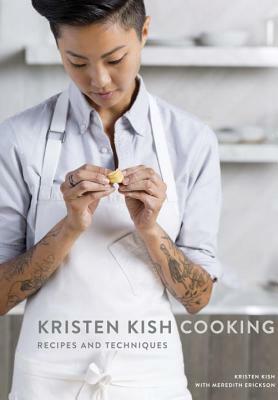 "Kristen Kish Cooking: Recipes and Techniques a beautiful, easy-to-read text that can serve both as a Bible for Kish super-fans (guilty as charged) and an aspirational manual of recipes for more advanced home cooks." "For Kristen, it's not about the food. It's about what the food can do. In her very first cookbook she shows us exactly what food can do: make us feel loved."